Every time I see Tom Kerridge doing his jolly ‘mine host’ act, I want to throw something at the TV. This is the man who proclaims he produces proper pub food. But if you go and look on the website for his pub, there’s not a single vegetarian main course on it. Oh, apparently a (note the singular) vegetarian option is available on request. And he’s been challenged on it before and claims he works with the customer if they contact the pub in advance. Sod that for a game of soldiers – I want to arrive somewhere for lunch without having to turn it into a military operation. Vegetarians of a certain age will remember the wars of attrition with pubs, where you either got cheese and tomato pizza and liked it, or the snooty ‘Oh, we’re far too busy to cater for vegetarians.” I’ve flounced out of more pubs in a strop than you’ve had hot dinners! I’m not a great pub person, as I don’t drink much, and I hate noisy places where I can’t hear what people are saying. But of late I’ve been taking far more notice of what pubs offer veggies. This not very scientific survey started at the Hunter’s Lodge in deepest Somerset. This is truly the pub that time forgot. It’s a cavers’ pub and it doesn’t look like the décor has been touched since about 1952. But the food does what it says on the tin. 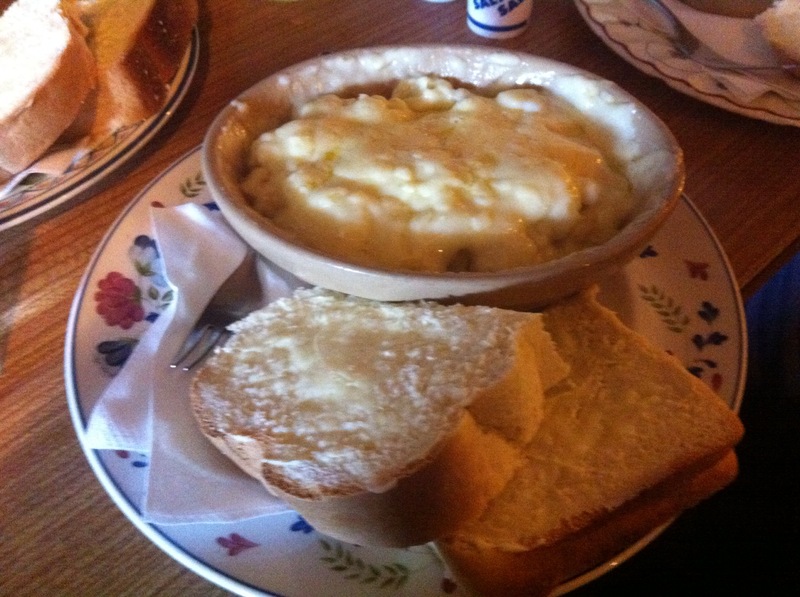 The tasty cauliflower cheese comes with hunks of bread the size of doorsteps. The cheese and onion roll has exactly that – about an inch of each. The menu’s not long, but it’s good, hearty rib-sticking food – and perfect if you’ve been grovelling around in caves under the Mendips. I spent a couple of days in London last week. On the second night, Anth and I met at the pub right opposite the museum, the Museum Tavern, where the clientele always seems to be a mix of tourists and museum folk. I think Anth was wondering why I was so keen to eat there. It was because I wanted their vegetarian fish and chips, which I’d had on a previous visit when my eating companion then had gone for the fish and chips – and I got unreasonably excited at trying the veggie version. The ‘fish’ is battered halloumi marinated in lemon and coriander. 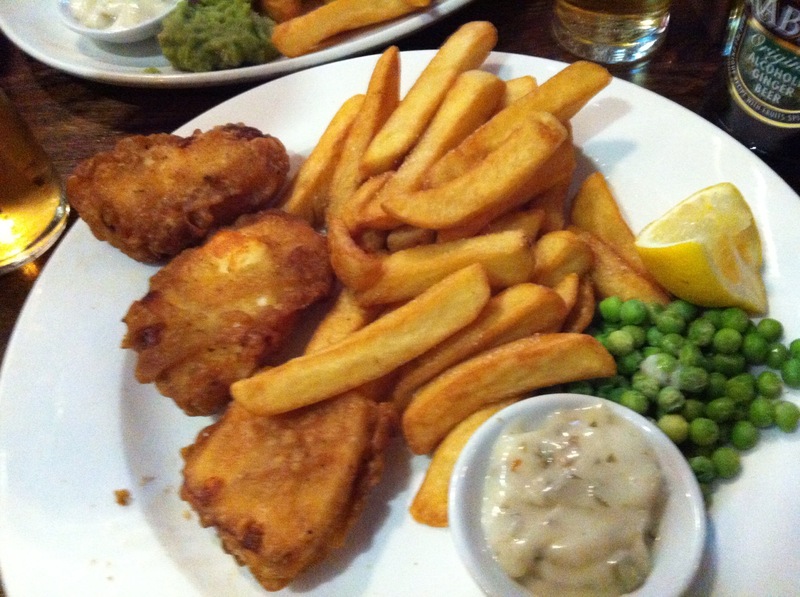 And very nice it was too, with a light batter, decent fat chips and peas (mushy or garden). One of the things I can never understand about pubs is how some of them make such heavy weather of vegetarian food. 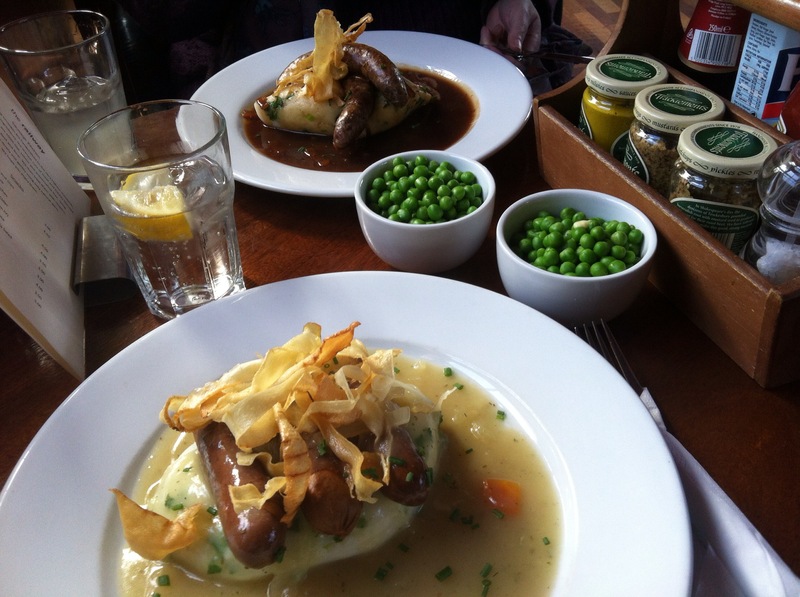 The Railway Inn in Cheltenham – known to me and my mates as the sausage and mash pub – is an example of how to make everyone happy with the minimum of effort. And yes, the menu is mainly sausages and mash. There’s a choice of getting on for 20 sausages, of which three or four are vegetarian. You then choose from four or five different types of mash. Then there’s either meat or veggie gravy. And you can add baked beans or peas for an extra quid. The food comes garnished with parsnip crisps, and you get a selection of mustards brought to the table. It’s one of my favourite places to go. With Sunday lunches, I want something tasty as my main, served with roast potatoes and plenty of vegetables. I got taken to the Bell Inn in Shurdington on the edge of Cheltenham by my dad and stepmother for a birthday treat. 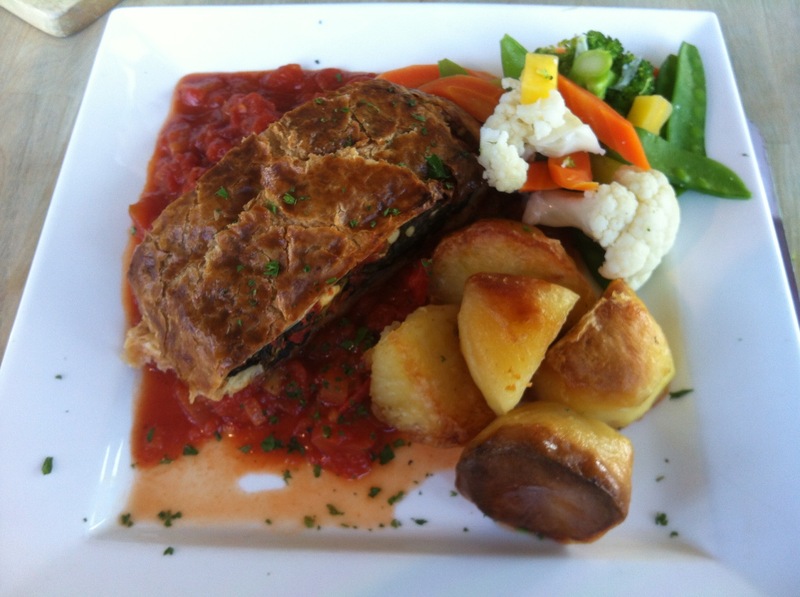 My eyes lit up when I saw that the veggie option on the roast menu was spinach, feta and pine nut Wellington, with a spicy tomato sauce. And yes, yes, proper roast potatoes and a bowl of decent mixed veg (broccoli, cauliflower, mange tout, carrot and swede). Sometimes you don’t want sun-dried tomatoes, fannied around with squash, or goat’s cheese. You want whatever your meat-eating mates are having. 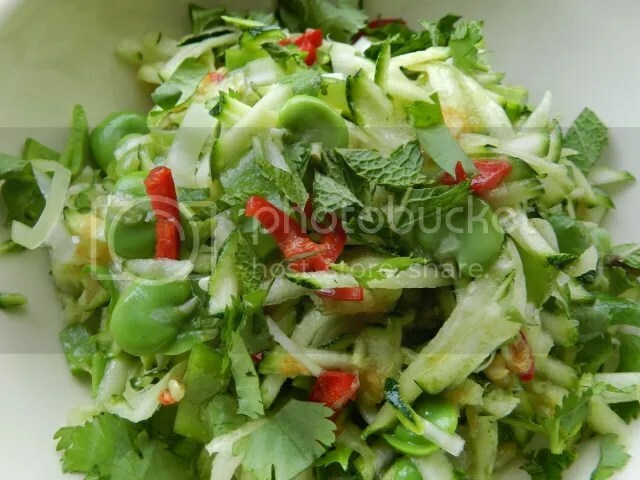 This is a lightning quick salad to produce, even quicker if you don’t skin the broad beans. 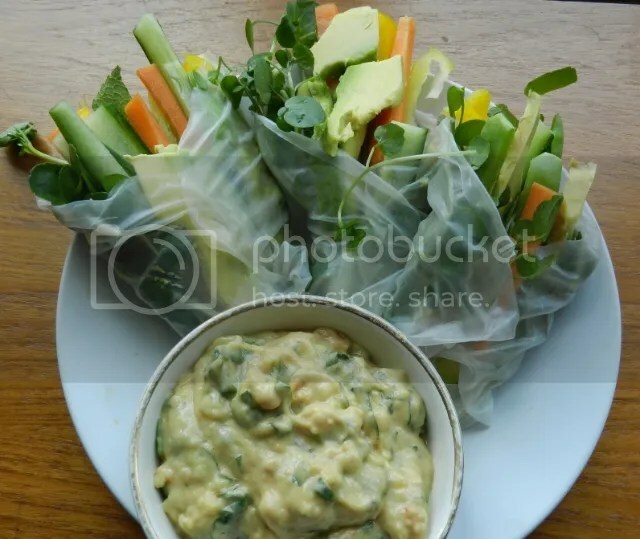 Whisk the dressing ingredients together in a bowl and leave to stand. Simmer the shelled broad beans for no more than 5 minutes. Put the beans in cold water and then slip the skins off. Add the courgette, beans, spring onion, mangetout and herbs into a bowl. Spoon over the dressing and toss thoroughly. You probably wouldn’t stumble on the Gower Kitchen by accident. It’s in Uplands, a way out of the city centre, in a run of unremarkable local shops. But it’s definitely one to come back to. I usually mistrust anywhere that describes itself as quirky, but the retro look hasn’t been overdone here, with mismatched furniture and bare floorboards. The Gower Kitchen is comfortable, friendly and serves good food that someone has clearly given careful thought to in terms of taste, texture and appearance. The four of us ordered a varied mix off the menu and specials board – and it’s the kind of place that doesn’t bat an eyelid if you ask for a starter as a main. Vegans would struggle to find much on the menu – it looks like you can request the cherry tomato and fennel risotto without the parmesan crisp, but you’d have to ask what had gone into the basil pesto it comes with. But for vegetarians there’s a small but thoughtful selection. And if you eat eggs and cheese, there are also brunch-type dishes to order. The pomegranate seed, rocket and feta salad was a divine starter – presented in a large glass bowl and carefully seasoned with what I think was a sweet chilli dressing. And that spot-on seasoning really came to the fore with my main course, which was a curried sweet potato, almond and coconut burger. It came with mango chutney, cucumber salsa and nicely-seasoned fries. The textures and the contrasts were perfect, and show just what someone with a bit of imagination can do with both burgers and veggie food. Prices are in the low teens for burgers, mid teens for most dishes and higher teens for steak. Sandwiches, starters and brunch items come in between about £4 and £6. And there’s a good range of alcoholic and non-alcoholic drinks, including some cocktails – it was most disappointing that my friends wouldn’t sample the supposedly edible flower in the wild hibiscus fizz! They don’t serve meals all day, although the bistro is open until 11pm. But it would be a perfect place to lounge around at weekend, drink coffee, eat cake and read the papers – and to avoid anything that smacks of work! I don’t think this is exactly new from Tesco, but it’s the first time I’ve seen it. They have a soya based mince in their frozen section. Unlike some of their soya pieces, this contains no egg so it’s suitable for vegans. I thought I’d give it a go. Out of the packet it looks like cooked mince. There is not much to differentiate it from Quorn mince, say. Once it’s cooked, however, I prefer it to Quorn. Something about Quorn mince always makes the sauce or gravy seem watery and thin. It didn’t happen with this soya mince, the sauce stayed reasonably thick. Texturally, it’s fine, chewy and substantial with a good mouthfeel. 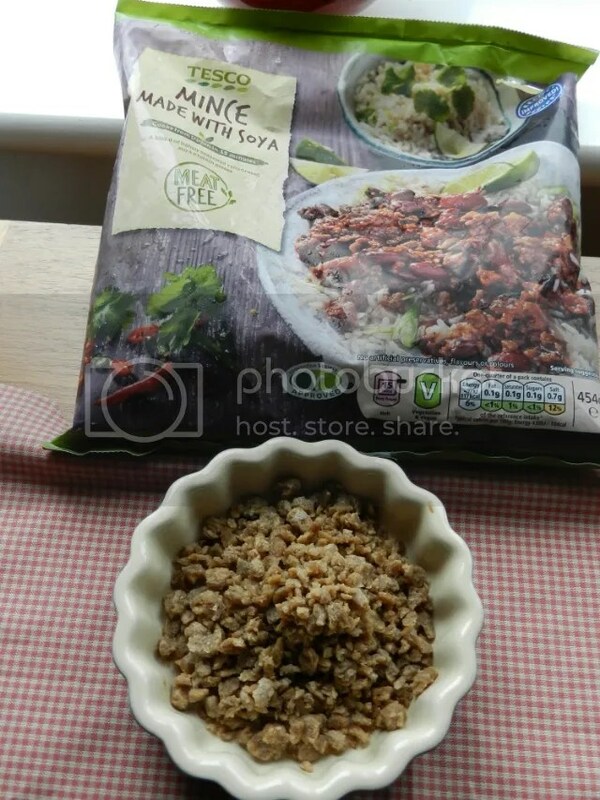 Tastewise – about the same as Quorn mince – nothing to write home about but not unpleasant either. A blank slate to add flavour to. If you want it to taste meaty, you’re going to have to add that umami flavour yourself. I tried it in my Mum’s bolognese sauce recipe and it’s good. Heat the olive oil in a large saucepan and add the onion and garlic. Cook on a low heat until the onion has softened. 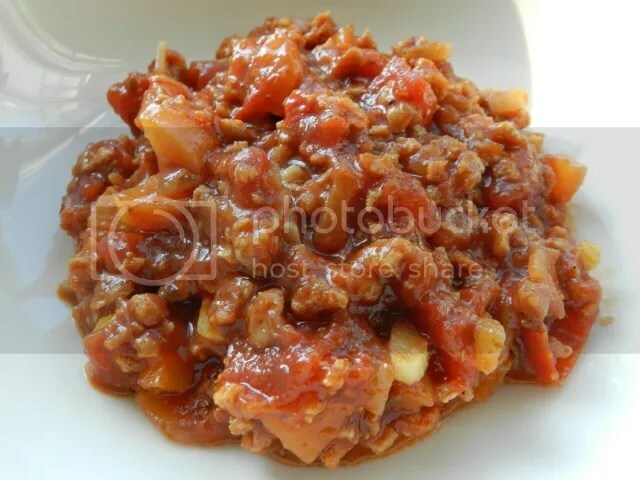 Add the carrots, mince, oregano, chopped tomatoes, tomato puree, vegetable stock and miso paste. Stir thoroughly and sea on with salt and pepper. Simmer, uncovered, for 30 minutes. Serve over the pasta of your choice with the fresh basil sprinkled over.